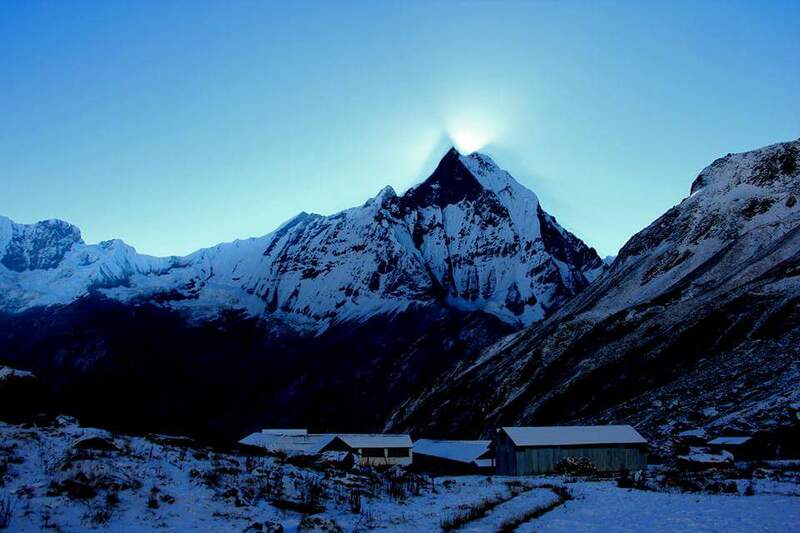 The Annapurna region is our second most popular trekking destination in Nepal. 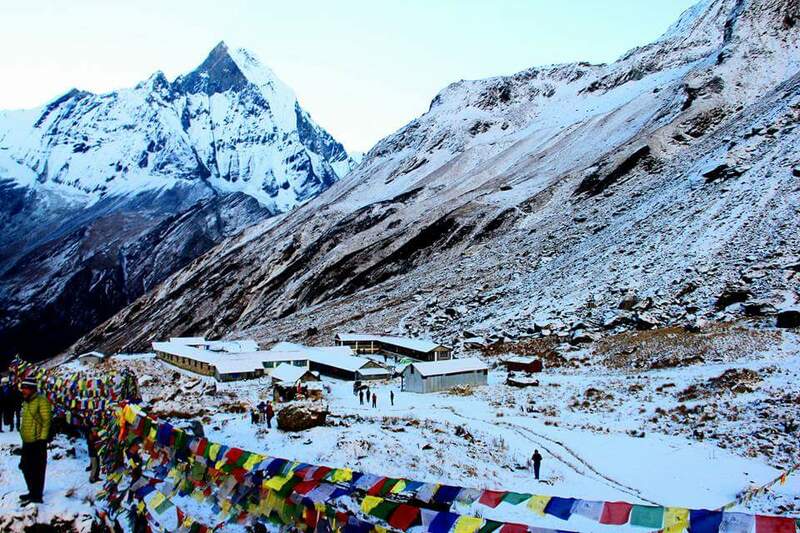 Our Annapurna base camp trek is our most popular trek. We run 10 plus treks a year to this region. The Annapurna region of Nepal is easy to access by a short 25 minute flight from Kathmandu. In 2021 there will be a new international airport in Pokhara and this will offer even better access to the Annapurna region. The gateway to the Annapurna region is through Pokhara. 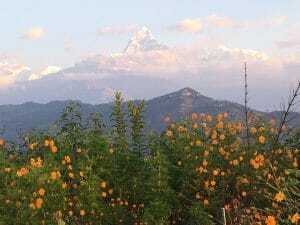 You can access Pokhara 950m/ 3,117 feet by bus or plane. 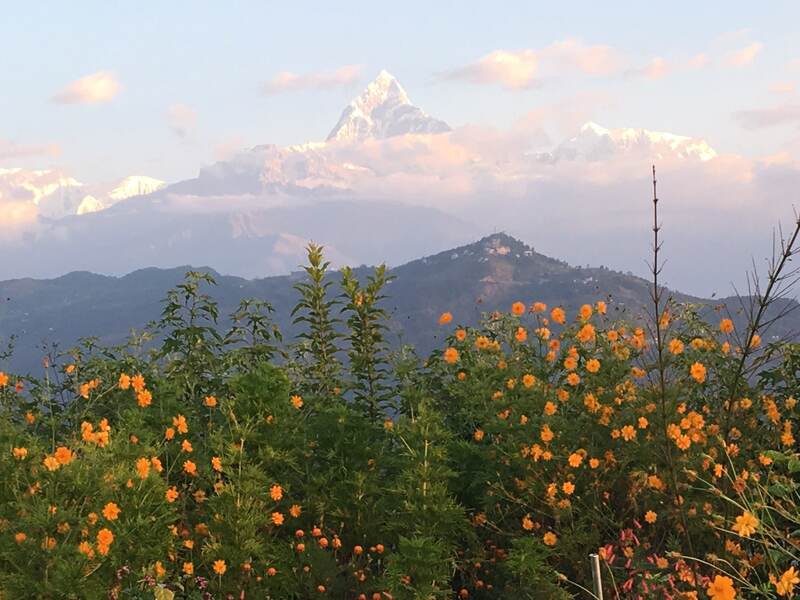 Pokhara and the Annapurna region are west of Kathmandu and have some of the best Himalayan mountain views. The Annapurna region holds a number of 8,000m/ 26,000ft peaks along with some of the stunning mountain views from the comfort of higher levels of oxygen around Pokhara. The view along the Himalayan mountain range is very special. 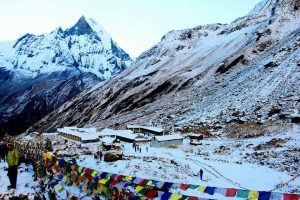 Getting close range access to Everest is much harder and to stand amount the giants in the Everest region does require a more challenging trekking journey. The Annapurna mountain region is 34 miles long and access is from the Pokhara valley in the south. Read some REVIEWS from our trips. It is important to prepare yourself for a trek to high altitude and be aware of the risks associated with travelling at altitude where the oxygen is far less than sea level. 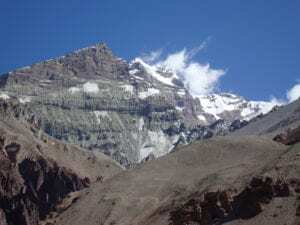 For example, at Annapurna base camp there is 35% less oxygen than you may be used to at sea level, where on the summit of Annapurna I there is only 40% of the oxygen we breathe at sea level. Annapurna I is one of the main attractions and the 10th highest mountain in the world, it stands at 8,091m/ 26,545ft. 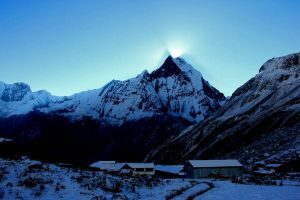 The Annapurna region, conservation area and called the Annapurna sanctuary is home to some of the world’s best treks and climbs. The Annapurna peaks are among the world’s most dangerous mountains to climb. K2 along with Kangchenjunga have higher fatality rates. 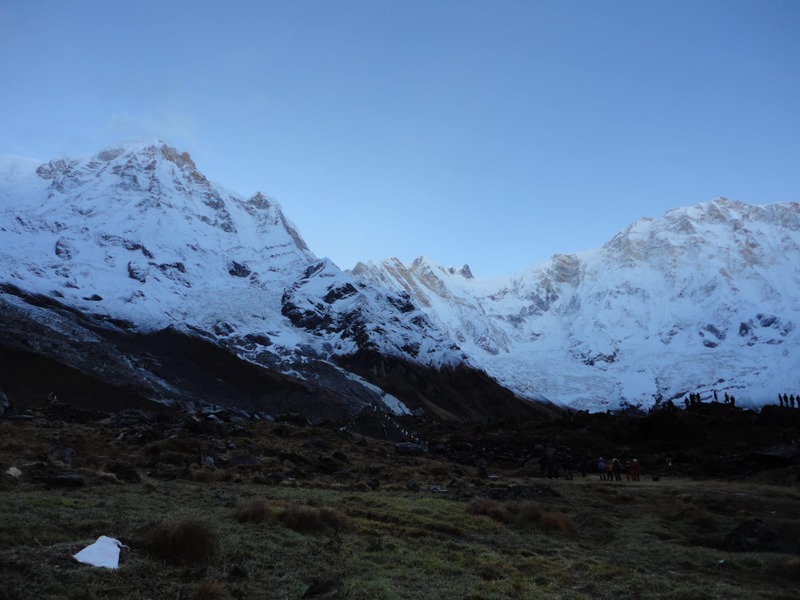 Annapurna In particular, the ascent via the south face is considered, by some, the most difficult of all climbs. In preparing to travel to altitude it is very important to move upwards at a controlled and slow pace. Above 3,000m/ 10,000 ft moving more than 700m/ 2,296 ft per day can cause excess stress on the body and can result in different high altitude symptoms. Exercising at altitude increase the red blood cell count, enabling you to safely move to higher altitude. You need to maintain an excellent level of hydration. 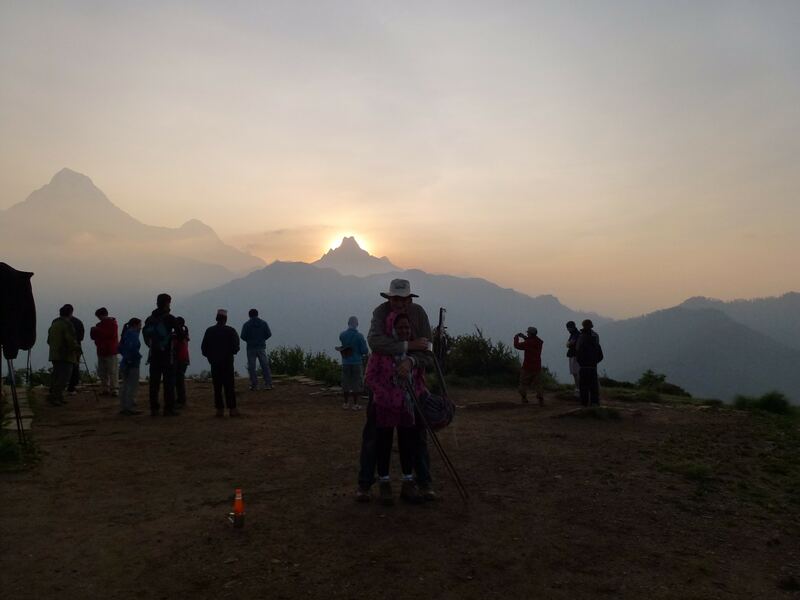 Getting enough sleep is also a key factor when trying to get your body used to higher altitude and less oxygen and recover for multi day trekking. It is important to be aware of Acute Mountain Sickness (AMS) when traveling to high altitude. This mountain sickness can be life threatening and is caused by moving too high, too quickly at high altitude. Headache, vomiting, fatigue, and muscle pain are all signs of mountain sickness and if these symptoms persist, returning to a lower altitude is the only option. But don’t worry, just because you have altitude sickness once, this does not mean it will happen on a return visit. Our schedules have more acclimatization helping you make a safer journey to altitude. For more information on altitude sickness and how to recognize the signs and treatment associated with mountain sickness, visit our our services page.